Awesome Product Excellent Condition SuperFast Shipping A++++++++! As ordered. Recommend this seller! Arrived late and no communacation. Won't buy from them again. Good quality portable metal hose reel with a couple minor flaws. Pros:Very easy to use and move around. Not too heavy. Reel works well and turns easily. Hose reels on/off without having to guide it. Cons: No hose gaskets included. You will have to have one to attach the hose that comes with it to the inlet. The handle section needs a second bolt hole and bolt on each side to keep it from wobbling (This can be done by the buyer if wanted). Great product. Needs a little tweak. Easy assembly, with good instructions. 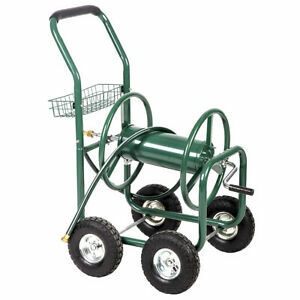 Sturdy, well made, easy to move around. Winds the hose smoothly, with minimum problems. Water hookups are leak-proof. The center of the winding reel and the reel crank are much too low to the ground for comfort. Another 6-8" higher would make this product perfect, and much easier on the back. Got this today, and put it together with ease. Had a few extra nuts and bolts. It sure seems sturdy. Rolled easy. Am looking forward to many years of use, Shipped to me within 2 days! very pleased. Far superior over the plastic ones & holds 2-3 times more hose. Highly recommend buying the metal type. Made pretty sturdy, & cost not much more than the plastic ones. Easy to assemble, took me less than 30 minutes to put together. Have had no problem with it leaking so far. I will never go back to the plastic ones, for sure!! !